Our 250ml diffuser is the perfect present for someone who needs to unwind, de-stress, and rediscover themselves with some well-deserved pamper time. Lie back, relax, and reminisce with this wonderfully-nostalgic aroma, combining the evocative scents of fragrant violet and romantic rose with uplifting lemon top notes and balancing musky base notes. Enchanting rose—an exquisite scent that has been sought-after, loved, and treasured for hundreds of years—offers a wealth of benefits aside from its timeless fragrance. Relieving anxiety, improving the symptoms of depression, and naturally increasing libido, this powerful scent is a precious addition to this beautiful blend. Refined floral violet is the perfect complement for rose, with its perceived ability to dispel anxieties, relieve nervous exhaustion, and ease both headaches and migraines. This wonderful little plant is native to Italy, France, Greece, and China, but is cultivated all over the world due to its intoxicating scent and pleasant flavour. Typically, the leaf extract is used in aromatherapy, and the incredibly low yield makes it an expensive and highly-prized scent. The citrusy top notes of this spirited perfume beautifully complete the blend and offer a mental lift—stimulating while calming, relieving conflicted thoughts, and helping you to reconnect spiritually. 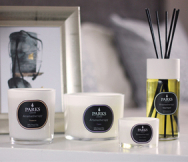 Together, these exciting scents combine to create an ethereal fragrance that is stunning, unexpected, and memorable, transforming your home into a personal haven of tranquillity. The purest scents are blended by our expert Perfumer in an elegantly-styled monochrome container and presented in our iconic packaging. This sensational room diffuser would look beautiful in any home environment and makes the ideal gift for a discerning friend or family member.